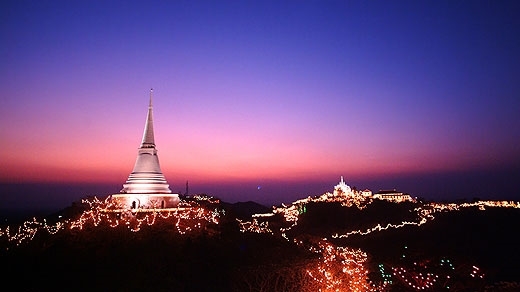 Petchaburi is a place where tourists can enjoy both cultural and natural sites at the same time. The province has been described as the place where the golden era of Ayuthaya still lives on and this is amply demonstrated in the magnificent architecture of palaces and ancient temples. After one hour (65 km.) drive from Hua-Hin we arrive at Wat Mahathat Worawihan which is one of the oldest and most famous temples in the area built by the Khmer. Part of the temple is more than one thousand years old. Here we will give the monks our merits which we have prepared for them and receive their blessing. 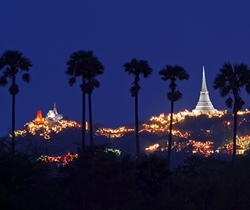 Onward to Phra Nakorn Kiri, commonly knows as 'Khao Wang' or 'Palace Mountain'. Here, on top of it, there is a string of building including the summer palace of King Rama IV (King Mongkut). There is a cable car taking visitors up and down the mountain. Then we go on to “Khao Luang” (Royal Mount.) which is a small hill with a cave full of ancient Buddha images. (There is also a beautiful temple on the right side of cave entrance). You can buy bananas and corn from the local vendors to feed these local monkeys, located right at the entrance of the cave. Buffet lunch at a nice hotel in Petchaburi before we return back to your hotel in Hua Hin.